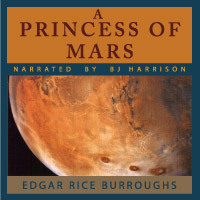 The third installment in ERB's legendary Barsoom series. John Carter has exposed the fraudulent Martian religion, and now there are many who want him to pay. Among them are the defrocked and black-hearted Thurid, and the bitter patriarch Matai Shang. These two villains concoct a plot that will not only plunge the Martian governments into perpetual chaos, but will condemn the plucky Dejah Thoris to a life of cruelty and misery. Continuing the Martian/Barsoom saga with creative characters, inventive environments and non-stop action, Warlord of Mars brings the Barsoom series to a satisfying, albeit tentative, close. 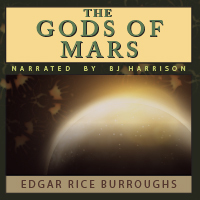 Love all three of the Mars books by Edgar Rice Burroughs! From McKay Bahr of pearland, Texas on 2/14/2018 . I thoroughly enjoyed all three of the Mars trilogy. The story is action packed. The love story is compelling. And the world of Mars is fascinating. LOVED IT. And of course,read with alacrity and passion! From Alex Long of Ankeny, Iowa on 3/13/2015 . 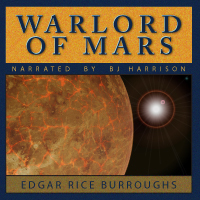 'Warlords of Mars' wonderfully wraps up the treads of the first two Barsoom books (effectively making the first three Barsoom books something of a trilogy.) One of my favorite things about this book is that, despite acting as the finale, the tone of this book remains the same as its predecessors. Fast paced, fun, and unapologetically fantastical, 'Warlords of Mars' ties up the first adventures of John Carter with a nice bow without taking itself too seriously. It's not 'Ender's Game' or 'Dune' or . . .
From Troy D. Kurz of Fredericksburg, Virginia on 3/9/2015 . Once again B.J.Harrison delivers, with a grand performance. Wonderfully Rendered by the Reader! From Daniel Kuehn of Golden, New Mexico on 3/7/2015 . A wonderful classic with a astounding reader that brings this Science Fantasy Classic to life. From Bob Phillips of Leeds on 12/11/2014 . It's near Christmas. You need a gift for an intellectual friend who drives a lot. Buy it this for them & make their wishes come true.